The Sims Mobile has a new event available right now in the game! 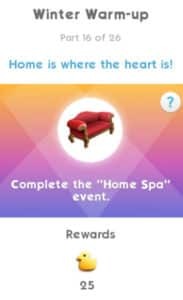 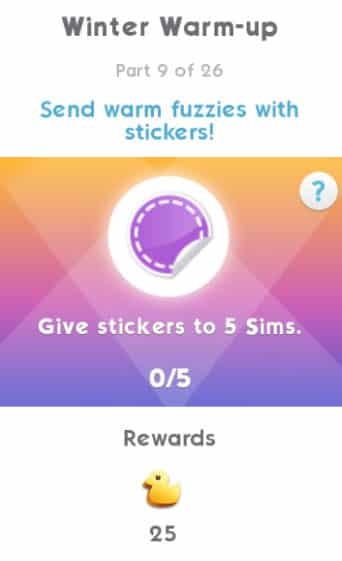 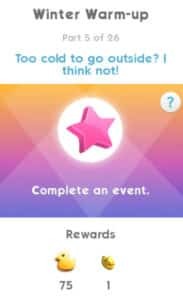 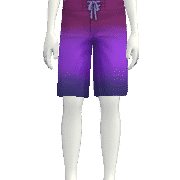 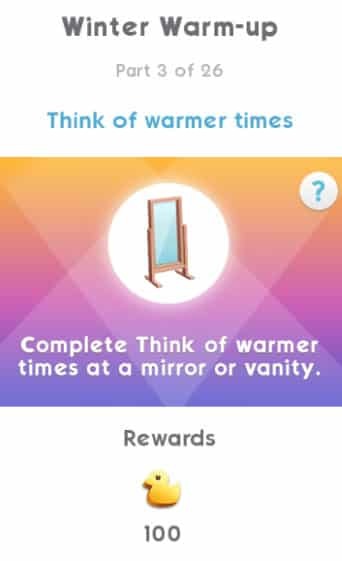 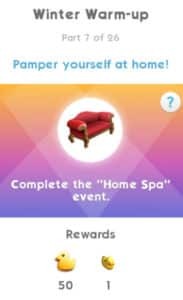 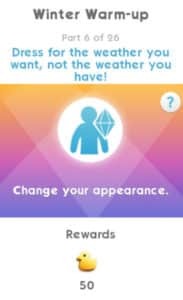 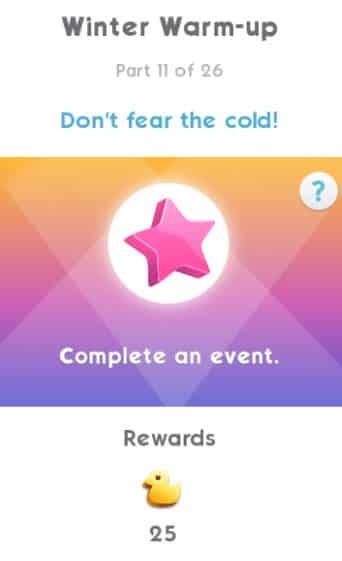 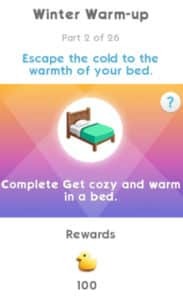 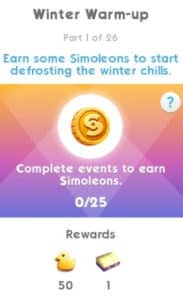 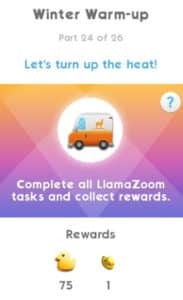 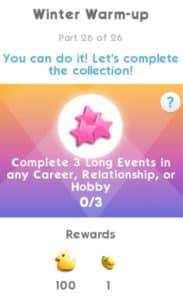 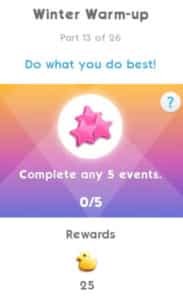 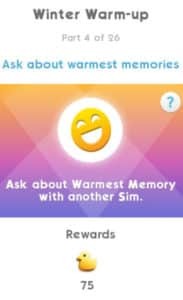 In case you’re not familiar, one of the very first events after the worldwide launch of The Sims Mobile was the Hot Tub Dreams event which is very similar to this one – except this time around the quest steps are different and there are a few additional items added. The Winter Warm-Up Event + Quest will last for the next 7 days during which you’ll be able to complete the quest, collect Duckies (the event token), spend Duckies on Duckie Bags which carry new items and gain all sorts of prizes along the way! 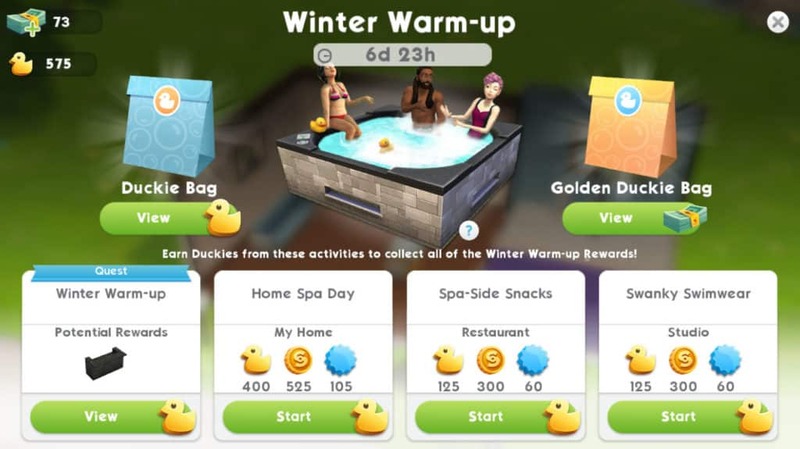 You’re able to access the Winter Warm-Up Menu by simply selecting the Rubber Ducky icon on the top right corner. 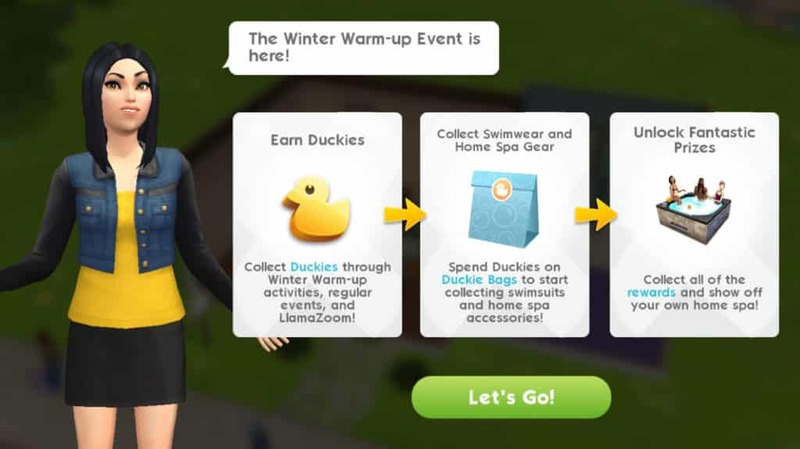 From this menu you’ll be able to have a full overview of Events that you’ll be able to perform in exchange for tokens and Simoleons, Duckie Bags which carry new items, lenght of the event and the number of event tokens you’ve gathered so far. 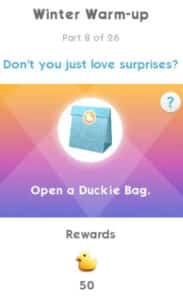 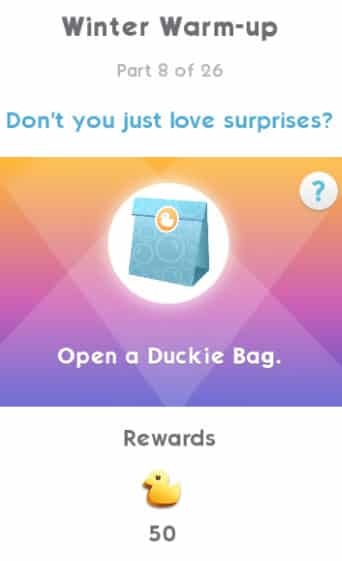 There are two different Duckie Bags – the regular Duckie Bag that you can purchase for 125 Duckies and the Golden Duckie Bag that you can get for 50 SimCash. 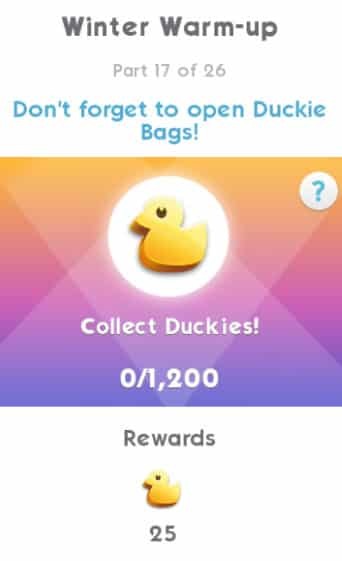 The difference between these two bags is the fact that the Golden Duckie Bag gives you much bigger chances of unlocking items marked with a Rare ribbon. The Winter Warm-Up Quest is a 7-day limited time quest which brings exclusive prizes that can only be obtained through the quest. Along quest completion you’ll also be obtaining Duckies that will help you purchase Duckie Bags. Completing the quest in total will grant you items such as the Backyard Bar, Beach Towels and a Rubber Duckie. The repetitive “collect 1200 duckies” and llama zooms are so annoying. Origin Surprise Sale: Get The Sims 4 Toddler Stuff for 50% off! 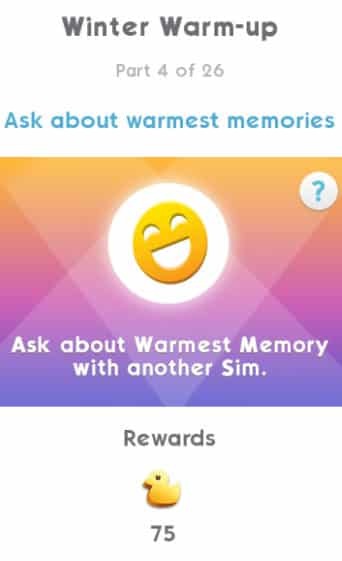 Origin Surprise Sale: The Sims 4 Movie Hangout + Romantic Garden are now 50% off!